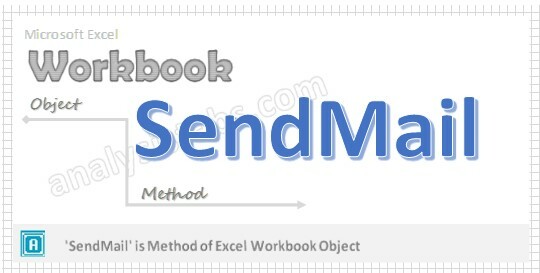 SendMail Workbook method is used to sends the workbook via an email as an attachment by using the installed mail system. When we use SendMail Workbook method in VBA? We use SendMail workbook method when we wanted to send an email to the specified recipients and workbook as an attachment. We can also send particular worksheet as workbook. Here is the syntax of SendMail workbook method in VBA. Recipients: It is required parameter. It specifies the name of the recipient(s) and added as To recipients. Subject: It is an Optional parameter. It specifies the subject of the message. If you don’t specify any name, Default name is document name. ReturnReceipt: It is an Optional parameter. Default value is False. If it is True notifies the sender when recipient receives an email. Please find the below example, it will show you how to send an email using SendMail workbook method using VBA. Explanation:In the above example it will send the activeworkbook as an attachment to info@analysistabs.com and subject is ‘Sample Workbook’. Please find the one more example, it will send one worksheet from a workbook. Explanation: It will create a new workbook with which we are copying worksheet and send as an attachment. And then finally it closes the new workbook which we created without saving. I really appreciate this blog post. You have very well explained the above instructions on VBA Send Mail Workbook. I have followed your all the instructions and easily resolved it.